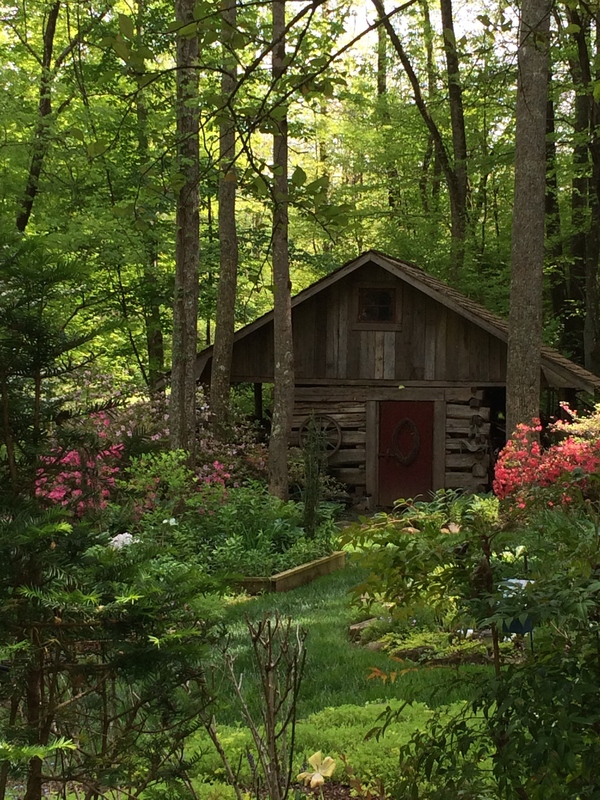 Suzie Hall’s Dogwood Open Garden 2015 | Oh, the Places We See . . . 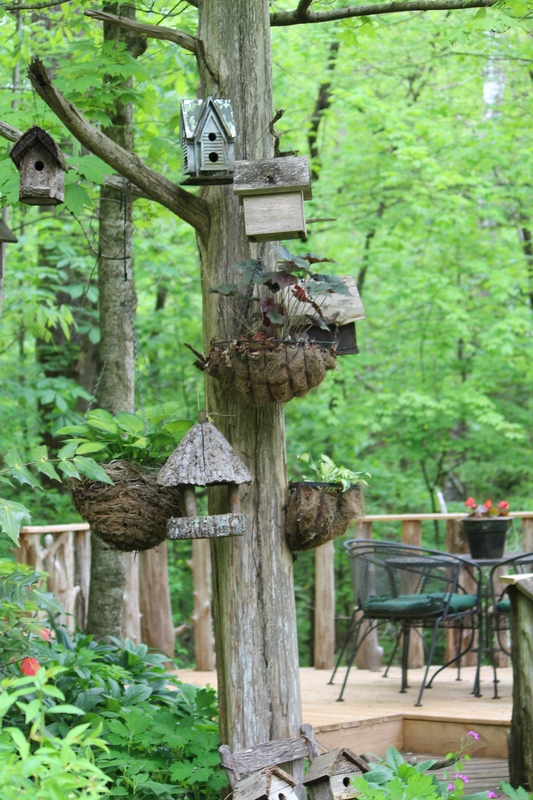 The woodland home and garden of Suzie Hall. 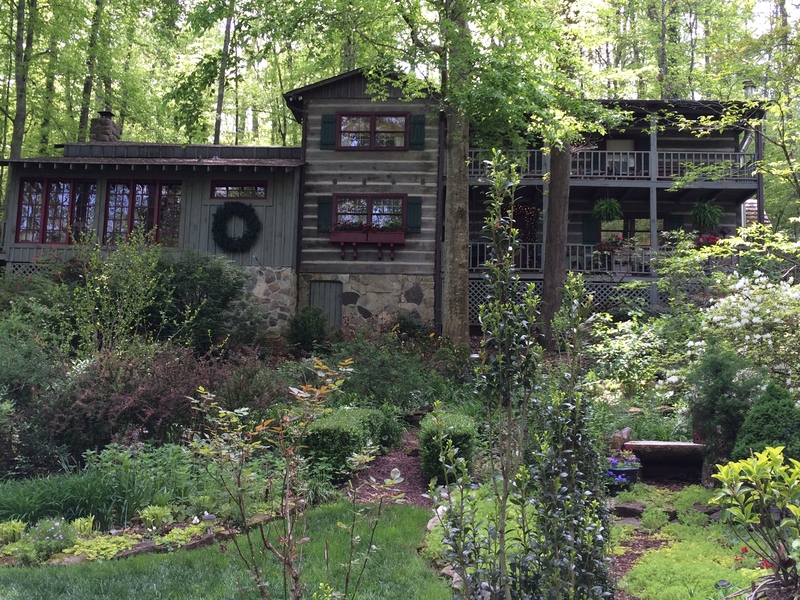 One word could pretty much sum up the garden of Suzie Hall in South Knoxville: woodsy. One of the many Dogwood Arts Open Gardens that allowed visitors to roam freely through a private space during the Dogwood Arts Festival designated times, Suzie’s garden is unique for its shade gardening opportunities and natural elements like boulders, tall trees, and a stream running through it. I might have missed this garden had it not been for Suzie herself visiting the nearby property of Tom Boyd and Sandi Burdick. She introduced herself to me and then insisted I come see her place. So glad she did. Lovely, woodsy pathway to the second house on the property of Suzie Hall. 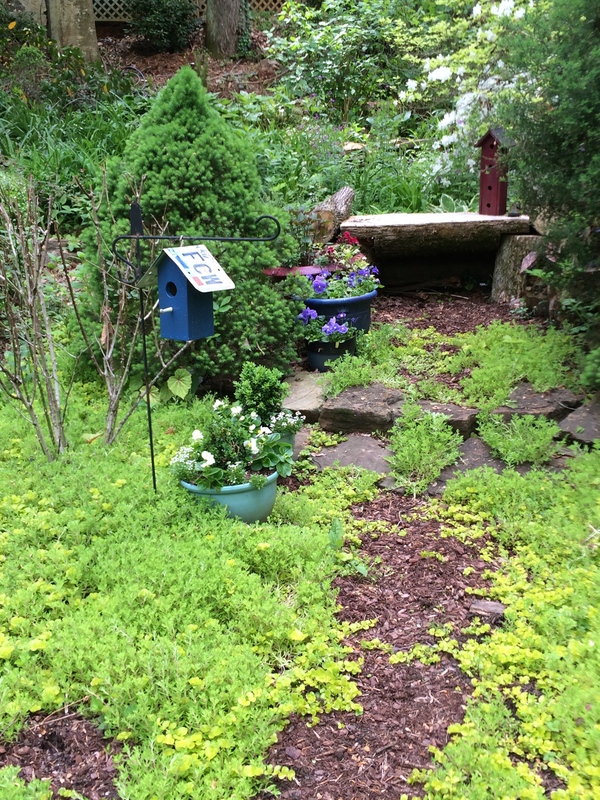 Suzie’s woodsy garden with its natural, almost uncontrolled pathways holds plants of choice but also “keepers,” those tiny pop-up plants that sometimes get a toe-hold and stay on ’til the owner deems the keeper an invasion. Suzie said she welcomes all plants — the more the merrier. So the garden has evolved — a balance of free-spirited plants and intentional ones. My first sight after parking remains one of the delights of the trip — the sight of a hand-built cabin nestled into that peaceful, woodsy setting. 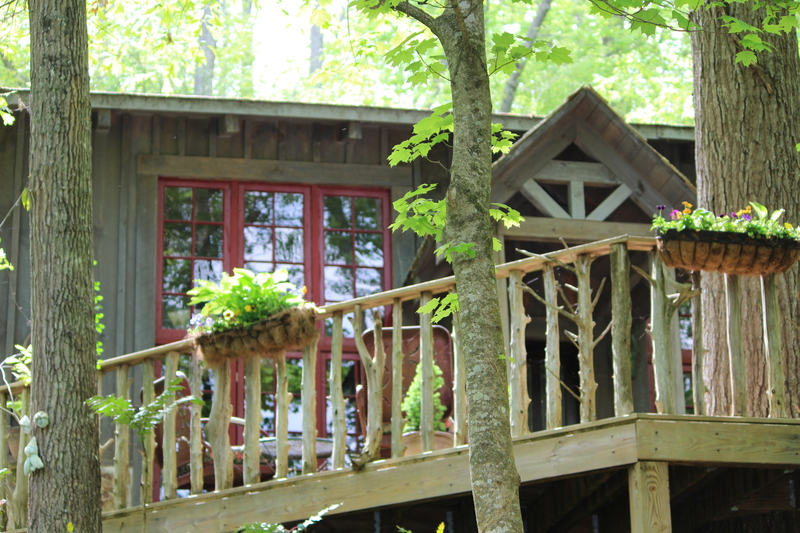 My husband had to move that cabin three times, Suzie said. And each time, he dismantled it, reconstructed it, and asked if we were done. But he had it facing the “wrong” way (She smiled.) so he did it over — three times — til he got it just right. And I just love it. 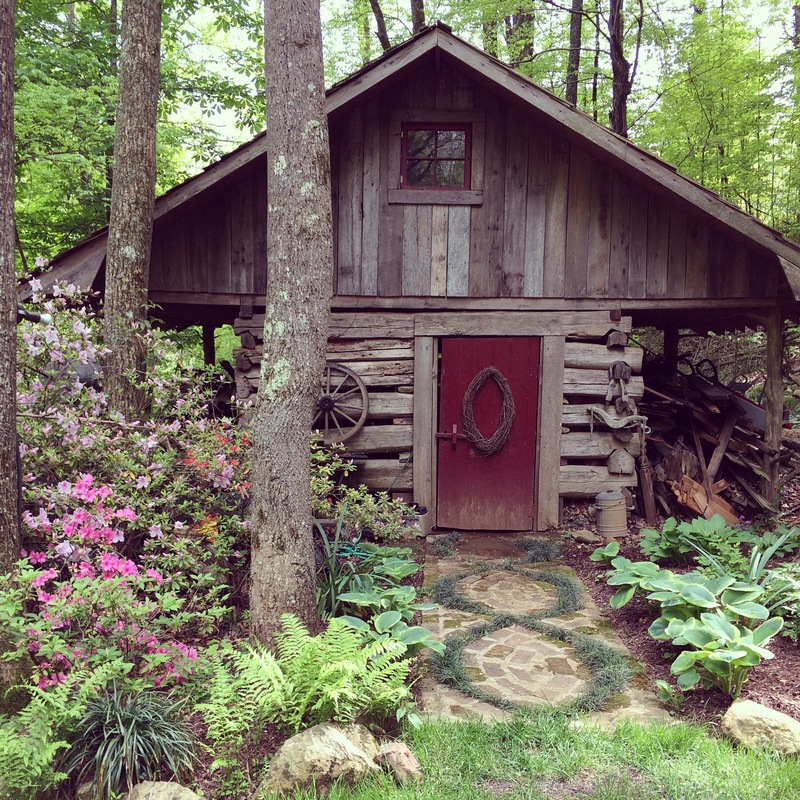 Focal point of Suzie Hall’s garden — this hand-built cabin, moved to this spot and reconstructed. Together, we roamed the pathways that Suzie and her husband had carved out of the property. 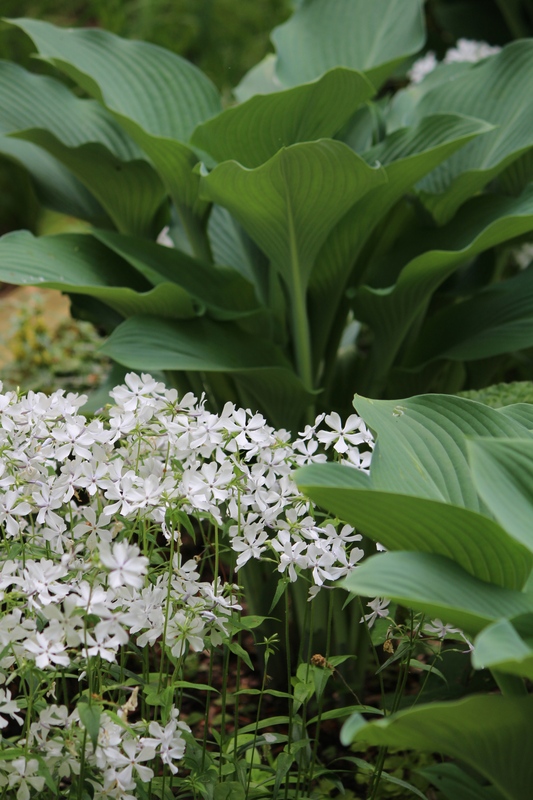 Everywhere native plants like shade-loving hostas, ground covers, and perennials as well as bulbs and giveaways from neighbors and friends thrived — a happy, harmonious mix of lush greenery dotted with floral surprises. The couple had built two houses in keeping with the surroundings and almost a dead match for the original old cabin on the property but with modern conveniences. Expansive decks allow for coffee time. And contemplation. And rest. Large decks allow for quiet time at the home of Suzie Hall. At the sound of water flowing over a smooth expansion of rock, I paused to bend down and look into the cave beneath. What a find this property must have been! 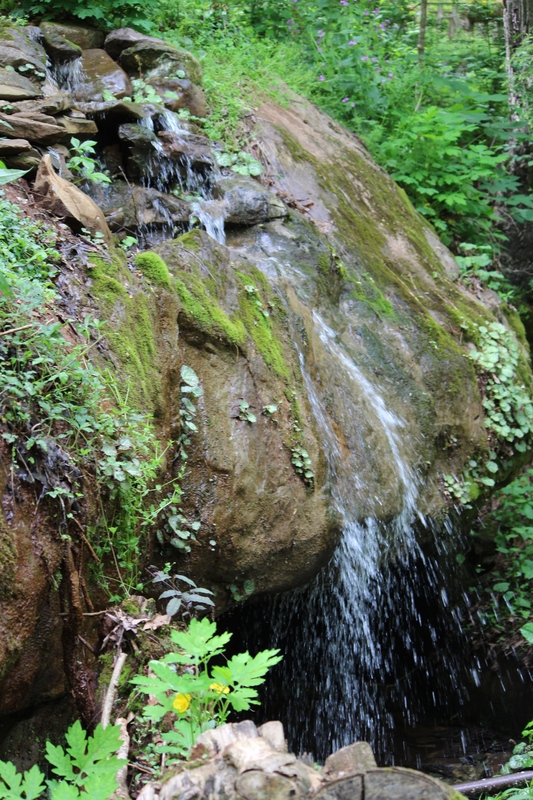 A waterfall runs over a mossy boulder. And underneath is a long, low-ceilinged cave. Suzie’s love for woodland adornments is evident at every turn. 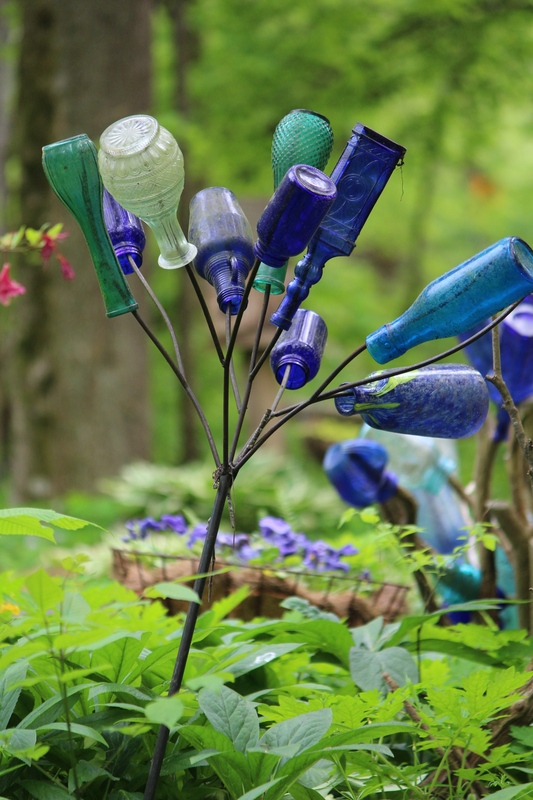 A bottle tree here, birdhouses there. 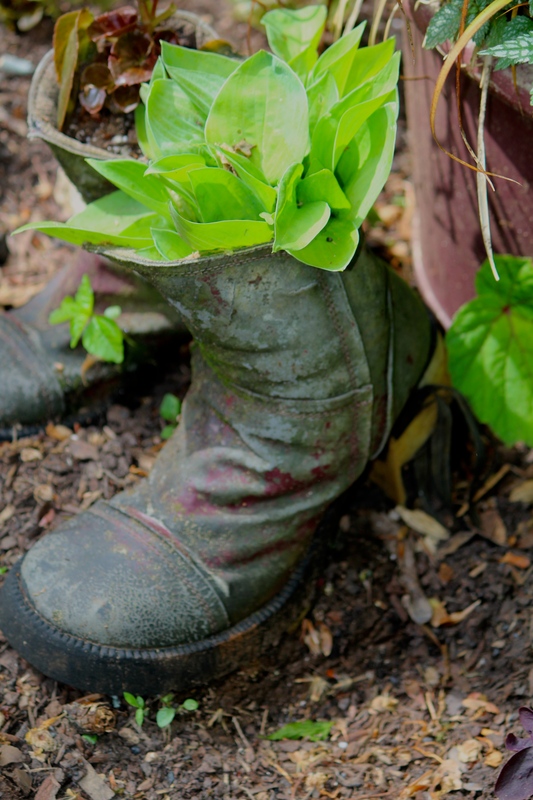 She pokes plants into found containers like old boots and whatever else comes her way. An old boot filled with plants. It’s no wonder that on the Saturday afternoon of my visit, a photographer and her assistants were busy at work, focusing lights and setting up woodsy vignettes, backdrops for Prom pictures. Who wouldn’t want to hold the object of one’s affection in such a lovely place? 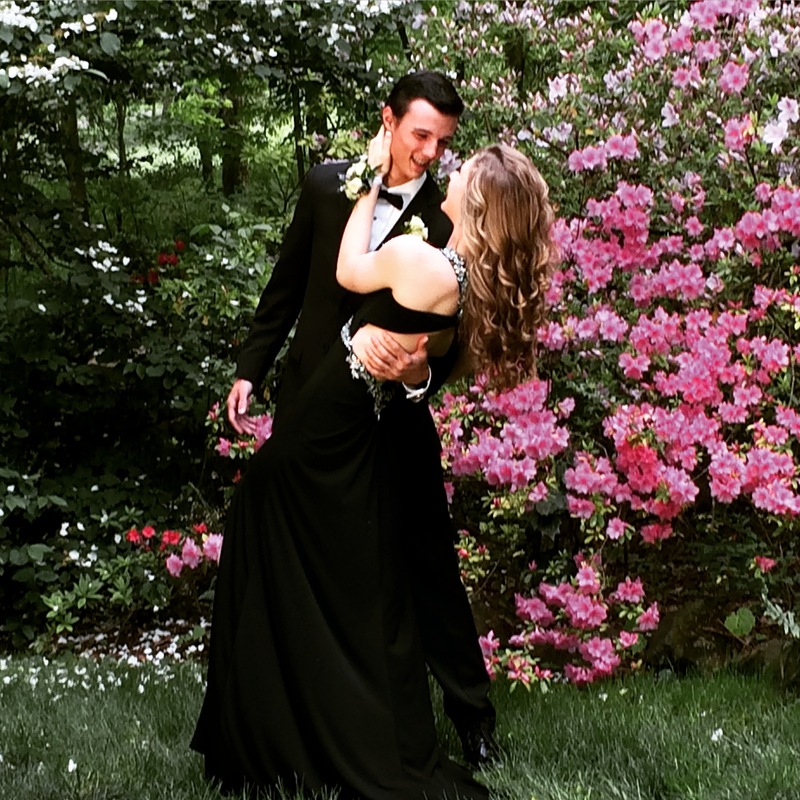 Couple dressed for the Prom pose for pictures in front of the springtime azaleas in Suzie Hall’s garden. 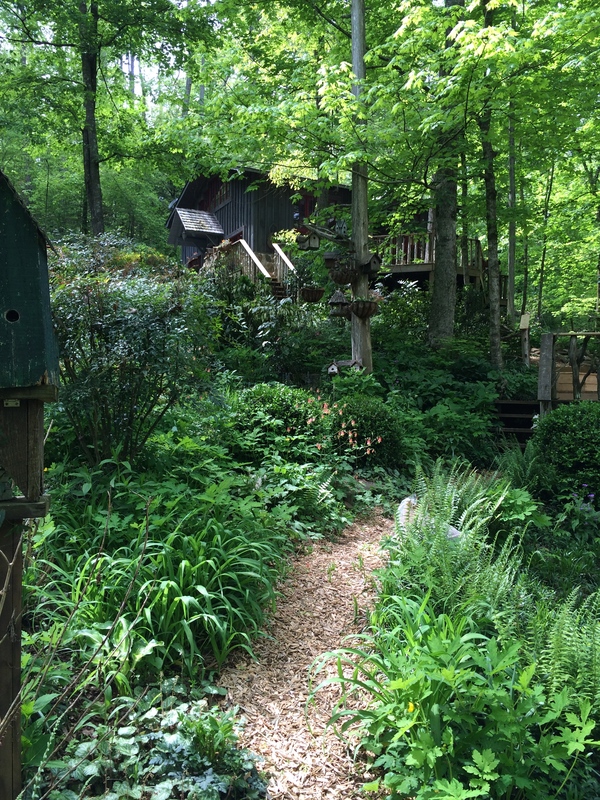 Thanks to the Dogwood Arts Festival Open Gardens committee for finding this natural, woodsy garden. And thanks to the owner/gardener Suzie Hall for allowing so many garden enthusiasts to enjoy it. 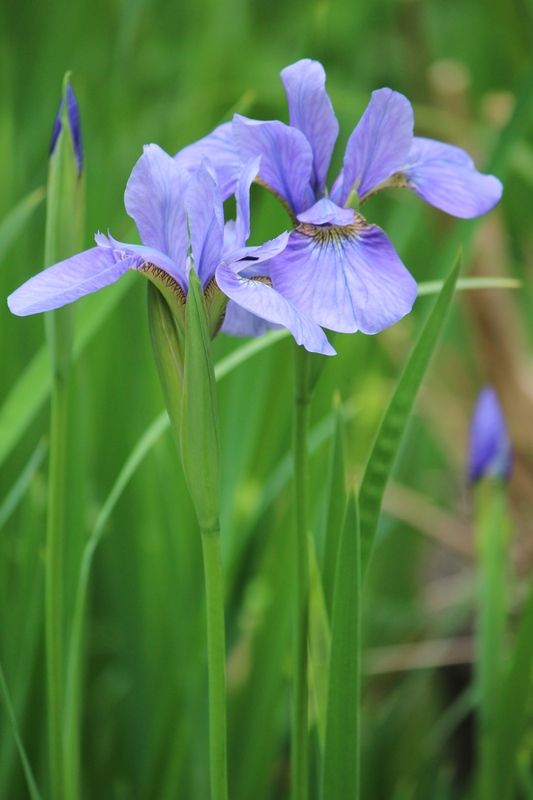 For a listing of the Open Gardens participants and camera sites for 2015, click here. And do you have a preference in gardens? Loosely structured? Controlled plantings? We’d love to hear about your love of gardens — just leave us a comment. This entry was posted in Gardens, Travel and tagged cave, Dogwood Arts Open Gardens, hosta, log cabin, Suzie Hall, waterfall, woodsy. Bookmark the permalink. Thanks, Vandy. All three gardens are special. So glad the owners let us view them during the festival. What a gorgeous garden. I’d like one just like that. I like your name for the self seeding “keepers” – free-spirited plants! Thanks for commenting. Another word my gardening friends use is “volunteers” — plants that reseed themselves or keep on comin’ one way or another. Since I struggle with gardening, I really need a few more volunteers to fill in my beds! Best wishes for a great week ahead. I love places like that, great for photography. Leanne, you have the best eye. But I believe with your skills you could make beautiful pictures in any setting. This was a good one for photos, though. And I’d like to sit on that balcony and just look down at the beauty! Thanks! I, too, loved seeing that cute couple. They struck numerous poses in various parts of the garden — so happy to be together all dressed up. Glad you stopped by to see it. A really fantastic garden – somewaht mystical in places. Thanks so much for your comment. This was a kind of mystical place — a place that anyone could relax in. I’m not sure, however, that the owners relax. They are so busy maintaining this beautiful garden that it may be a full-time operation! Sue, this is a great looking place, as you said. I loved the natural look of it, but there was plenty of orchestration by the owners, too. It just looked as if nature had taken over, when really it was part of a bigger plan! But Ian’t that the genius of a good garden designer!